Most Christians have never heard of William Branham and have no idea he even has a legacy. Some older Pentecostals and "charismatic" Christians view him as a great evangelist and gifted healer who strayed from Christian orthodoxy in the latter stages of his ministry. They believe this is the reason for his obscurity today. His followers (estimated at between 500,000 and 1,000,000 people) believe him to be Elijah the Prophet, the fulfillment of Malachi 4:5. There are many different sects within William Branham's followers, although they all refer to themselves as believers of the Message of the Hour. Some of his followers believe that William Branham's every word was infallible, while others will admit that he did make some minor errors but he was infallible with respect to his visions, prophecies and his interpretation of the Bible. Some, as a result of facts coming out of research by us and other former message followers, view William Branham as a charlatan who was either willfully deceptive, or had untreated mental health issues. William Marrion Branham was an evangelist who has been called the "pacesetter of the healing revival"  and a "prophet". He was born in rural Kentucky, raised in Indiana, and in the 1940’s his healing ministry skyrocketed him from a rural pastor to an international evangelist. William Branham was compulsively deceptive with those around him. He often embellished stories, facts, and scriptures to his own advantage. What you hear on William Branham's recorded sermons is only one side of the story, yet that story often blatantly contradicts documented history. This life story account is based on both his recorded sermons and as many historical documents as we could find. Any statements that can be substantiated by written historical documents are referenced. Hopefully this will let you decide for yourself whether William Branham was honest. Click here to learn more about William Branham's three birthdays. The Branham family moved from Kentucky to Indiana when William Branham was a young boy. William Branham claimed this was his first fulfilled prophecy. Charles Branham was in trouble with the law at the time, which may explain why he used the name as “Brainon” on the 1910 census records. William Branham said that he received two visions as a young boy in Indiana. The first was when his father asked him to haul water for the moonshine operations. William Branham said that a voice spoke to him out of a whirlwind in a tree and said, "Never drink, smoke, or defile your body in any way, for I have a work for you to do when you get older." By his own testimony, William Branham never drank alcohol in his life – other than in Church as part of communion. Who Died on the Bridge? Click here to learn more about William Branham's first false prophecy. William Branham also told of a second vision that happened a few weeks later when he was playing marbles with his brother. He said that he saw the construction of the Louisville Municipal Bridge being built across the Ohio River, and 16 men falling off to their death during its construction. He said the vision told him that this would take place 22 years from the time of the vision. The Louisville Municipal Bridge opened on October 31, 1929 which means that this vision took place either before William Branham was born or while he was an infant. 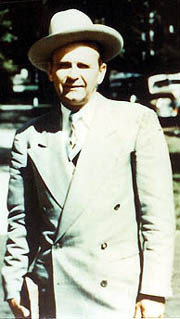 Charles Branham broke horses for Otto Wathen, and later became his private chauffer. Otto Wathen owned the R.E. Wathen Distillery as well as the Louisville Colonels baseball club. William Branham said that their family lived on Wathen’s residence for a time. Click to discover whether Charles died when William Branham was a child. William Branham recalls that compared to other families, the Branham's were poor. At school his shoes were often torn, and he would sometimes wear a closed jacket when he had no shirt to wear. William Branham also said that his father died when he was a young man, forcing him to drop out of school and become the bread-winner for the family. He did this successfully by hunting and trapping, where he learned to shoot straight in order to preserve costly ammunition. By 1926, (at the age of 16, 17 or 18) William Branham had enough money to buy a new Model-T Ford. He also claimed to have been initiated as a hunter on a trip to New York’s Adirondack Mountains , and to have hunted as a young man in Maine with the famous naturalist Burt Caul (who he called “the most cruel-hearted person I ever seen”). Through his teenage years William Branham did not want to have anything to do with God, or church. It was during this time that a fortune teller told him that he was born under a rare alignment of stars. In 1928, he told his mother he was going camping in Green’s Mill, Indiana, and left to work as a ranch-hand in Arizona. He returned after he received news that his brother Edward had died on June 20, 1929 at the age of 19. Edward's funeral was taken by a close family friend, Rev. McKinney, who made a salvation call that William Branham refused. William Branham was in Arizona during the time of the construction of the Louisville Memorial Bridge in 1929. As a result, he was not aware that Richard Pilton and Lloyd McEwan were the only two men who died during the construction of the Louisville Municipal Bridge, and that neither drowned. William Branham said that he was overcome by fumes while checking meters at the Gas Works in New Albany in 1931. When he went to a specialist, however, he was told that he had appendicitis and had to have an operation. Afraid, he requested a minister from the First Baptist Church to stand by him. During the time of the operation, he promised to preach the Gospel if God would restore his health. William Branham said that after this experience, he went into a field to pray, and saw a vision of a light that formed a cross. William Branham also said that he was converted in a Baptist Church , a coal shed , a saloon that had been converted into a colored Pentecostal church , and in a Jewish Hospital. Roy E. Davis & the K.K.K. Find out Roy E. Davis’ hidden secrets. In June 1933, William Branham had his first evangelistic tent meetings, in which 14 people were converted. William Branham received front page news coverage for these meetings in the Jeffersonville Evening News. 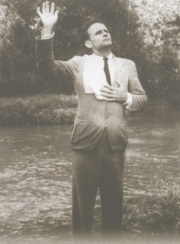 William Branham distributed a tract saying that a light appeared in August 1933 when he was baptizing the 17th person on the Ohio River, while 3,000 people watched from the shore. Click to learn about the voice at the river. Hitler would rise to power, build the Seigfried line, and give the Americans a terrible beating. Fascism and Nazism would be swallowed up into Communism, which would destroy the Vatican. Cars will be shaped like an egg. American women would begin to dress immodestly. A cruel woman will rule the United States. America will be ashes from coast to coast. Don’t eat eggs or live in valleys. William Branham claimed to have started construction on the 'Pentecostal Tabernacle’ in Jeffersonville in 1933 before he was married (this later became known as the 'Branham Tabernacle'). Or a Pentecostal Minister? Click here to find out. William Branham told of a vision he had on the morning he was laying the cornerstone for his new tablernacle. The vision was of an orchard, with places for new trees on either side of an aisle leading to the cross. Plum trees were on one side, and apple trees were on the other side, and both types of fruit were found in the cross. William Branham was instructed to walk between these trees (which he identified as the Trinitarian and Oneness Pentecostals), and do the work of an evangelist, as both types of fruit were found in the cross. Later in his ministry he began preaching that the Trinity and Oneness doctrines were of the devil – in direct violation of this early vision. William Branham said it was, based on a vision. 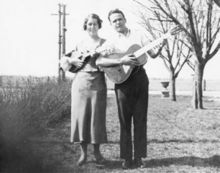 Already married, and a pastor of a Pentecostal church, William Branham travelled north to a town called Mishawaka, where he was received warmly by a group of mixed European-American and African-American Pentecostals. William Branham often said that these Mishawaka meetings were his first introduction to the Pentecostal people. Without Roy Davis around to enforce his KKK agenda, William Branham began accepting a number of invitations to preach at various Oneness and mixed-race Pentecostal churches. The summer of 1935 was a whirlwind of events. Who did William Branham meet? In the fall of 1936, William Branham claimed to have a vision that the Ohio River would flood, and reach 22 feet over Spring Street in Jeffersonville. A daughter named Sharon Rose Branham was born to William and Hope Branham on October 27, 1936. A month later, William Branham’s father Charles passed away for real on November 30, 1936. William Branham later said that he had terrible grammar because of his father’s early death. 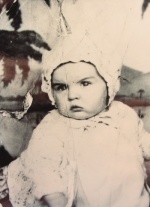 Sharon Rose Branham, who died at 8 months old. William Branham relays little about the years after the death of his wife and daughter. He mentions that it was a period of extreme trial, depression, and responsibility as he worked and looked after his son and pastored a Pentecostal Church. William Branham said that he attempted suicide twice during this time. The Jeffersonville City Directory named William Branham as a collector for the Public Service Company in 1939 and 1941, which indicates that he may have stepped down from pastoring for a few years. The hard times soon faded and William Branham married Meda Broy on October 23, 1941. (Meda was the daughter of Frank and Emma Broy, and was born on April 16, 1919. Emma Broy had divorced her first husband Daniel Lawton in 1907 before marrying Frank, who she divorced on April 3, 1929.) William Branham was then once again listed as the pastor of the Pentecostal Tabernacle in the 1943 Jeffersonville City Directory. ↑ The Dictionary of Pentecostal and Charismatic Movements: (Zondervan, 1988, p. 372) ~ Branham filled the largest stadiums and meeting halls in the world.’ ... As the pacesetter of the healing revival, Branham was the primary source of inspiration in the development of other healing ministries. ↑ The Full Gospel Men's Voice Magazine (February, 1961) ~ "In Bible Days, there were men of God who were Prophets and Seers. But in all the Sacred Records, none of these had a greater record than that of William Branham." ↑ Searching for Vindication Timeline - See Charles Branham’s World War 1 draft card for his birthday of January 2, 1887. The Census record from 1900 shows Ella Harvey’s birthday as June 1887. ↑ Proposing to Hope Brumbach - April 8 ,1909 is written as William Branham's birthday on his marriage certificate to Hope Brumbach. William Branham’s younger brother Edward was born in 1909 as the 1910 Census document show Edward Branham as being one year old. ↑ William Branham, September 30, 1951 in a sermon called “Expectation” in New York City. ↑ Searching for Vindication Timeline - marriage and divorce documents. ↑ Life story by Julius Stadsklev in a story written firsthand by William Branham. Also on recording on April 15, 1951, November 8, 1953 and July 20, 1952 in sermons called “A Life Story”. This page was last edited on 8 December 2015, at 05:53.